47 13/16 x 63 13/16 in. Gift of Barnett Banks, Inc. 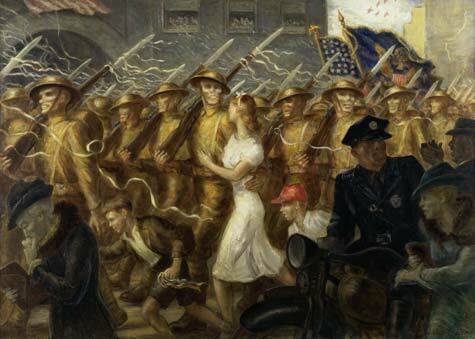 Painted in the years between the Great Depression and World War II, Parade to War, Allegory reflects many Americans’ apprehension about joining the looming conflict. John Steuart Curry transformed a celebratory parade into a gruesome scene, where young soldiers morph into skeletons. Beneath the streamers and waving flags, Curry portrays conflicting emotions. In the center of the canvas, a young woman in a white dress and two small boys seem unaware of the impending peril, while two women in the foreground are distraught and overcome with grief.